no wonder it feels eerie!!!! A New Adventure for Cassiopeia and Me! The wind is coming up early and strong for a Marina Del Rey morning. It is gorgeous and clear from where I sit in my new apartment overlooking the marina, but the wind is somehow unsettling. The cacophony of clanking halyards and howling wind is making me feel antsy. It always amazes me how the wind can be so disconcerting to me when I am on land, and today is no exception. It feels eerie and dramatic, especially for 7 in the morning. Perhaps if I turn my thoughts to the sea and all of the adventures she promises, I will feel less ill at ease. Truth be told, I cannot wait to get back out there. Soon, I hope! Cassiopeia and I are working towards that goal now, as we slowly ramp up our game. I have been sailing more lately, and as I slowly emerge out of the haze of the past months, I can see in my mind’s eye my next sailing goals and dreams materializing. 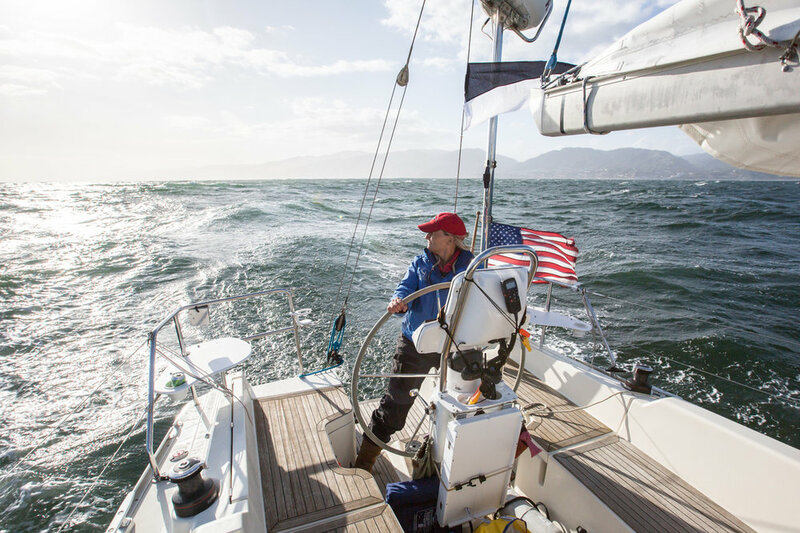 My sailing adventures fell to the back burner for a while as I navigated some personal challenges. Slowly though, I feel the fire being stoked, and I can feel the horizon calling me again. The most recent development is that I have decided to race I the Sunset Series here in Marina Del Rey. These races are our local Wednesday night buoy races put on by California Yacht Club, that go from now until September. I have crewed a lot in this series and other races like this in my life, but have never skippered my own boat in them. As I am sure I have mentioned here before, race starts intimidate me, and being in charge of a crew of people has always felt daunting to me. So, I decided to do it anyhow! Just as with all other decisions in my life, it just came to me one day that I should do this, and with an all-woman crew. So, that is what I am doing. Thankfully I have a lot of wonderful ladies in my life who love to sail. I have invited a crew of experienced racers and enthusiastic newbies alike, and I fall somewhere in the middle. My goal in doing so is to create and foster an environment of mutual support and learning, so we can all learn and grow from wherever we fall on the spectrum. A new and wonderful friend of mine, who is a very experienced racer has agreed to be my coach and tactician. I am so grateful, because the thought of going in cold and without support would stop me in my tracks. I couldn’t be more excited (or intimidated) about this new adventure. I have been taking a clinic on race starts the past 2 weekends. 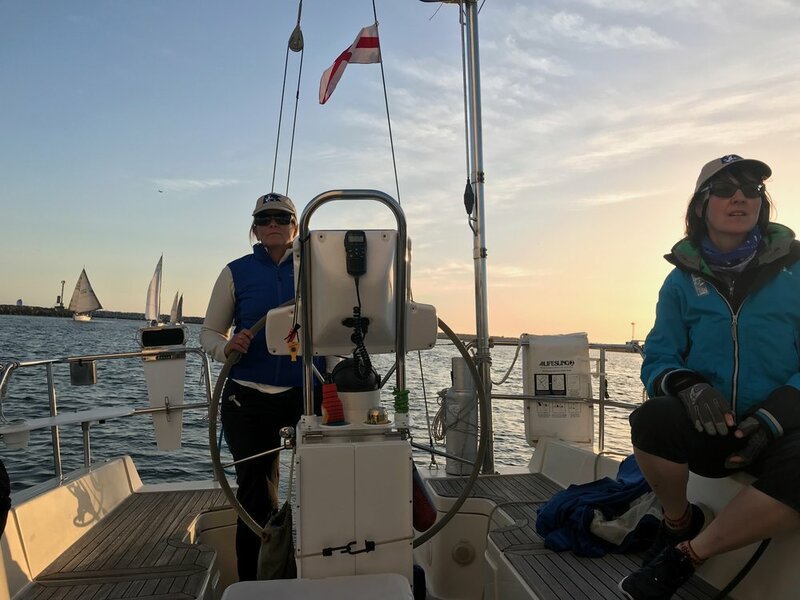 Last weekend I was coached by my talented and experienced boyfriend on his boat, and this weekend I will be sailing with my friend Lara for the first time to get our strategy and communication plan together for the season. Last night I attended the seminar for the race series. I went alone, as none of my crew could make it. I will admit that though I saw some familiar faces there, I felt really intimidated. It reminded me for a second of how I felt when I walked into the skippers meeting before the Singlehanded Transpac. Everything sounded at once familiar and completely foreign and daunting. I know myself well enough to know that I need a hands on experience of all of this in order for it to start to make total sense. I have faith that it will, and have faith in myself that I will learn exactly what I need to exactly when I am meant to. I am so grateful to my friends for being willing to embark upon this new journey with me. I feel so supported and so excited to have a team of strong women by my side as I dive into this new adventure! I know that we will all emerge better and stronger for it! Some thoughts on Bravery and a Shout out to Nathalie Criou! I have been thinking a lot about bravery lately, and what that means to me as a woman and as a sailor, and how those two relate. Something popped into my Facebook feed today by Brene' Brown that stopped me in my tracks. She was talking about her daughter's graduation from high school and all of the emotions that emerged in her as a result of that milestone. Its a great post, and you can read it here. In that post she said that their family motto is that it is "okay to be brave and afraid at the same time". I love that, and as I read it I realized that I have experienced the power of this very paradox in my own life. I have found that by allowing both, deep growth and great accomplishments are possible (and even inevitable)! 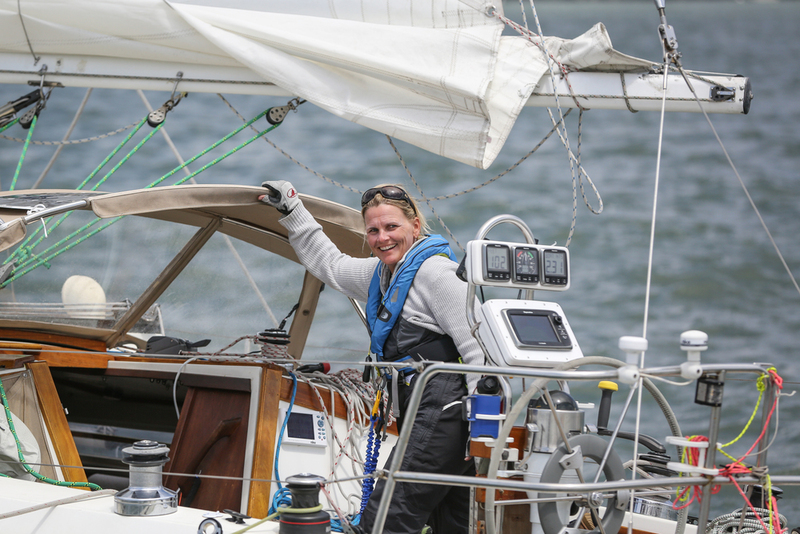 I concurrently read a blog post by my new friend and one of my sailing inspirations, Nathalie Criou. 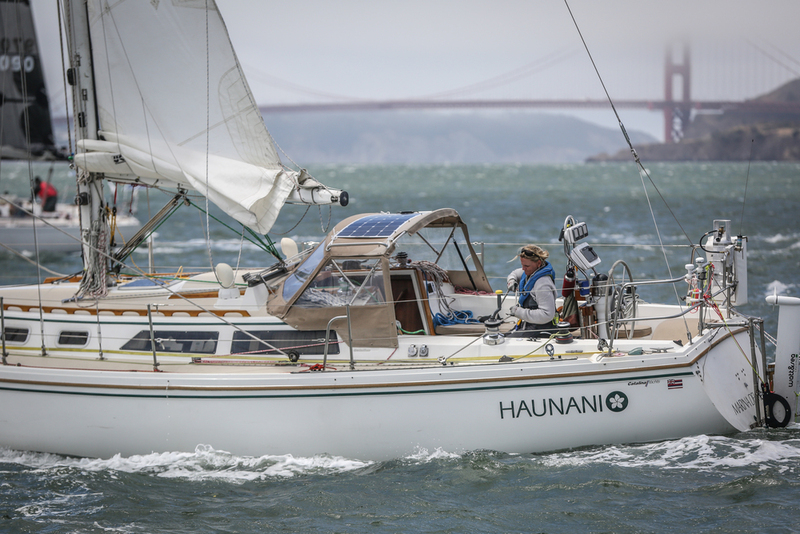 Nathalie is a veteran of the Singlehanded Transpac (2014) and is currently in France getting ready to race in the Solitaire Urgo le Figaro , an historic French singlehanded race, which starts on May 26! 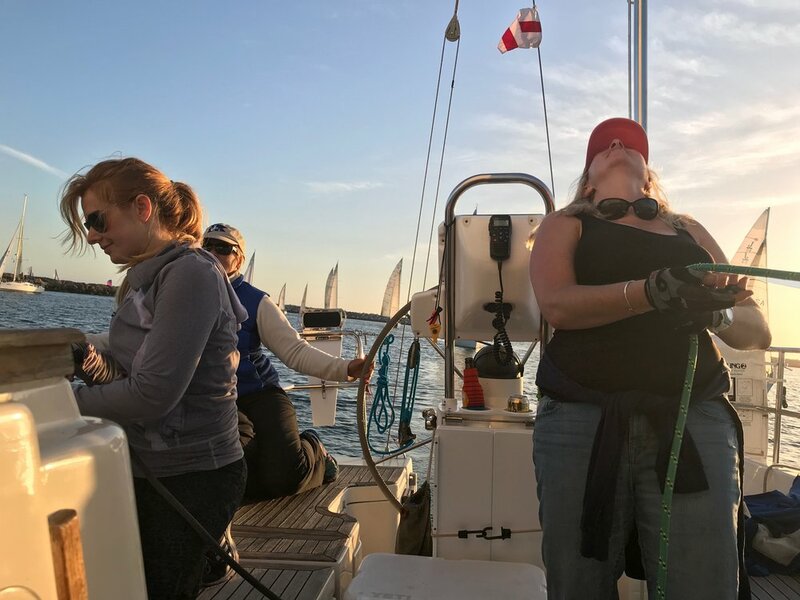 In her post, she speaks of her "healthy dose of fear" as she comes face to face with some of the top sailors in the country. 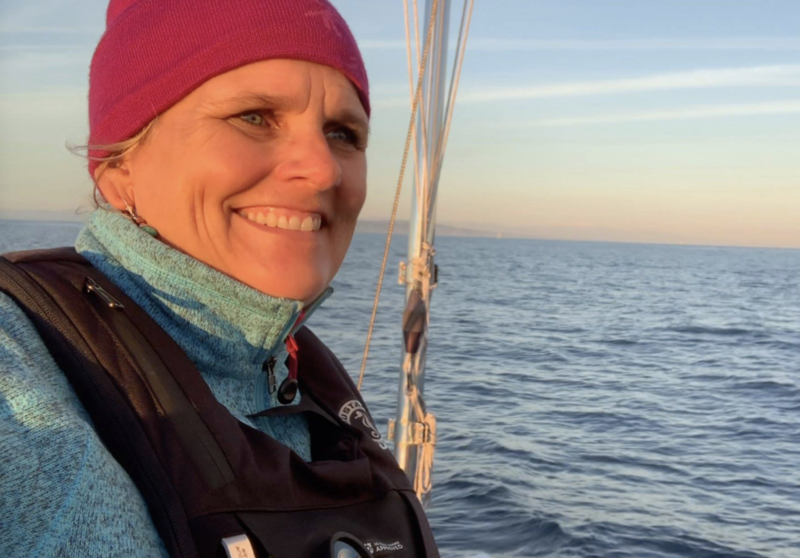 She is a very accomplished sailor herself, and I am sure she will give them a run for their money, but what means the most to me as someone that looks up to her, is that she is acknowledging her humanness in so many ways. She also has the best attitude about it and says that learning a lot and having fun will happen no matter what, which I love and wholeheartedly agree with! After reading her post today, and knowing that she is over there on her own preparing to sail in a very prestigious and challenging race, I had to stop for a moment and acknowledge her bravery! She is brave to believe in herself enough to do it, and she is brave to do it, and she is brave to admit her fears. The latter, to me, is the biggest piece of her bravery! Please join me in cheering her on, and stay tuned for an interview with her here on my blog when she returns from France!! My hat is off to you Nat!!!!! 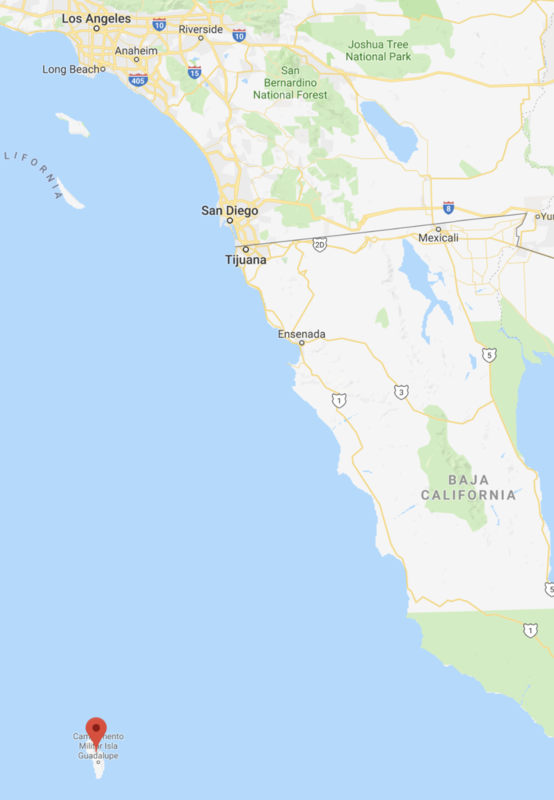 Catalina to Port: From the starting line located near Palos Verdes buoy "10PV", leave the West End of Catalina to port, finish when Catalina East End light (Fl w 6s) position 33 18.1162N 118 19.0570W is within 0.5 NM and bears 350°M from the helmsman's position. Handicap distance 41 NM. My crew (and dear friend), Scott and I departed the dock at 8am on a beautiful warm Southern California morning. We had a lovely cruise to PV 10 and arrived just before check in. I felt very excited as we headed towards the start, because more and more boats were appearing around us which brought with them the promise of a well-attended race! I believe we had 13 boats entered, and by 10:30am we were all tacking around waiting for our 11am start. I have to admit that I will never tire of the pre-start ritual of cruising the starting area with everyone, waving hello to each other and checking out each other’s boats! I had my usual nervousness about the start, but was coached well by Scott (and even though did not quite do what he said, I was a little aggressive…. at least for me) and we had a solid start right behind Jerome on Biohazard. As we made our way across the channel, we were holding our own among the fleet, and that felt really good (I am still pleasantly surprised by Cassiopeia’s litheness compared to Haunani’s). 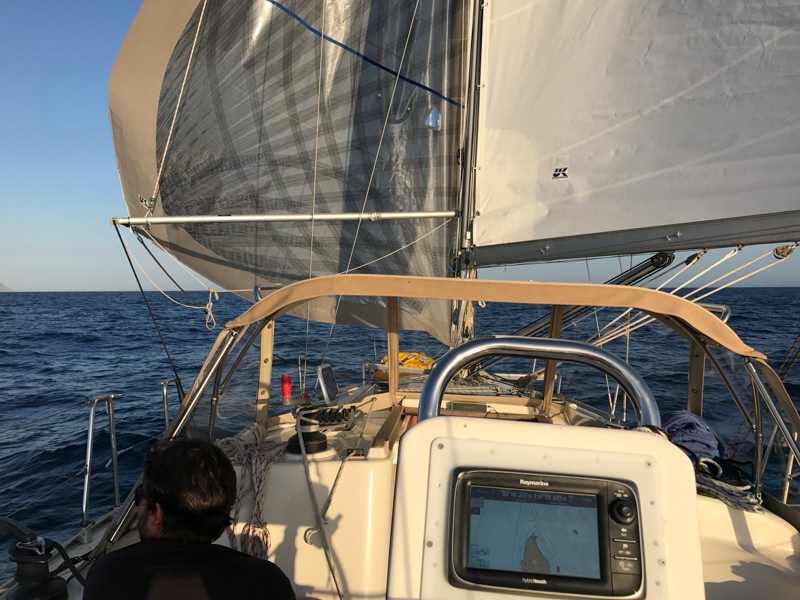 Due to the wind angle we had a couple of indecisive moments about which tack was best to make the west end, but once we settled on a direction, we got into a groove and were in a really good place. Cassiopeia was moving well in the semi light wind, and we made good way across the channel. We came around the West end and the wind got really light. As we got closer and closer to Eagle rock, I decided we should tack and head away from the island. As we did that, we caught a little breeze and started to move a little better until we were away from the island a bit and clear of the wind hole that seemed to be plaguing everyone else. From there we headed down the back side moving slowly but well. At one point we tried to deploy my spinnaker (asymmetrical), but the wind was too light for it to be effective, and we decided to douse it and pole out the genoa instead. 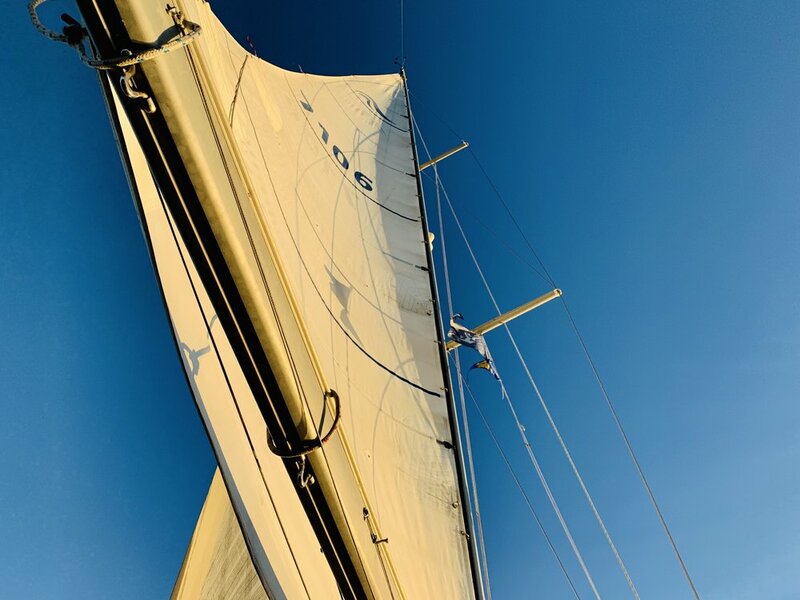 I have to admit that the mixture of getting to know my new boat (I have only flown the spinnaker one other time, and have never used my whisker pole with her), and the flukey conditions had me pretty flustered. I know that I will get there, but it is anything but a seamless operation at this point! A lot of people retired from the race early on, and we got close too at one point, but I am glad we stuck it out, because we got into a nice little groove out there, and about 2/3 of the way down the island, the wind came up into the 20’s and provided for a very fun ride to the east end. One of the most fun things for me was converging with Rod on Rubicon III and then having him hot on our tail as we flew towards the finish wing and wing, riding some pretty big rollers. We stayed in front of him until the wind died just shy of the east end light and true to form, he scooted right past us in the light air. It was a spectacular sunset and a beautiful day on the water. I am so grateful to Scott for being such a great teammate out there. As always we had a blast together! We tucked into Avalon around 9pm and were both exhausted and ready for a hot meal and sleep. 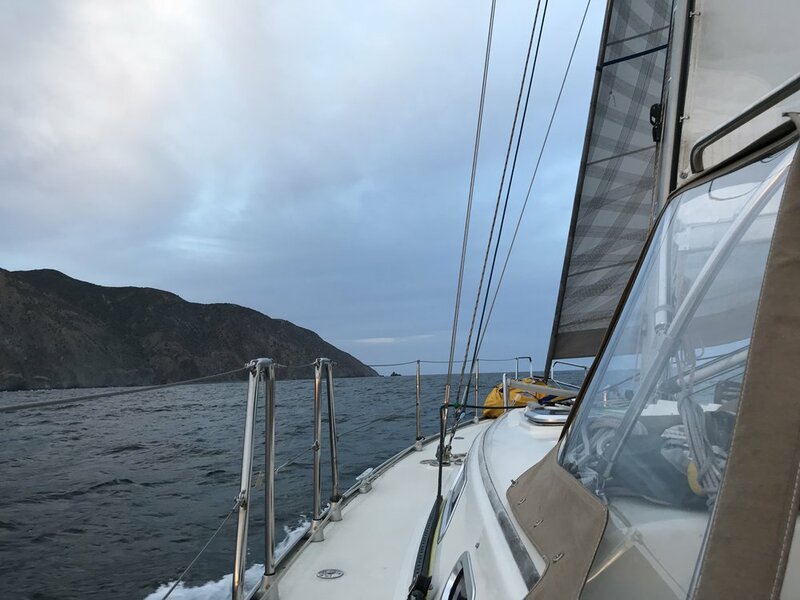 We were lucky to get to spend the entire next day and night relaxing in Avalon, and had a fun sail home on Monday afternoon! Saturday was my 1st race on Cassiopeia! It was also my 1st race period on my own boat, outside of PSSA races (and of course the SHTP). 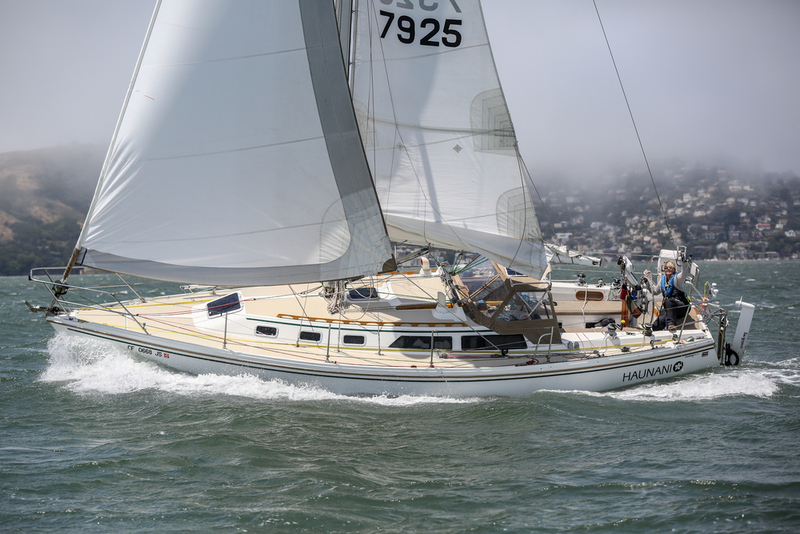 It was the first of the Berger/Stein Series races and it was from Marina Del Rey to Malibu and return. Being near the start line as everyone was tacking around waiting to begin, was such a wonderful experience. I knew most of the boats, and was now seeing them all from the vantage point of my own as I sailed by them waiving hellos and shouting good lucks! I missed being aboard dear Eggemogin, as I had in the two years prior, but this was a new beginning for me, and I was excited to try something new. We didn’t have much wind, but it was a lovely day to be on the water! I was lucky enough to be double handing with my dear friend Whitall, who taught me so much in one day about light air sail trim, and despite the super light conditions, we were able to keep moving all day. 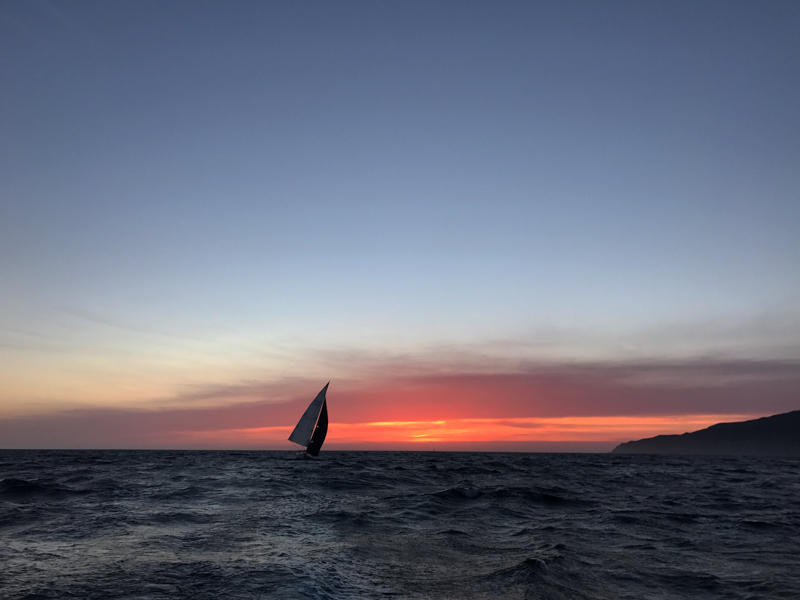 We, like almost everyone else, aborted the race just before sunset (about 2nm from our mark in Malibu). It was futile to try to finish in those conditions, and I was just happy we got as far as we did. The sunset was reason enough to be out there anyhow, and we heartily drank in the beauty and solace that unfolded before our eyes as we made our way home. I was literally moved to tears by the majesty of it all. It’s hard to accurately convey why every sunset on the water can drop me to my knees. No matter how many I have witnessed or how frequently I witness them. It always feels new, and it invokes a sense of reverence in me like nothing else I have ever felt. Nature in general, and the sea in particular is truly my “church”. I feel the closest connection to spirit when I am out there, and the sunset hour seems to be the most sacred of those times. As the sun splashes its light along the horizon, the veil between worlds seems to be almost non-existent, and I can viscerally experience being one with God, nature, the universe (whatever you want to call it....to me it is all the same). Being on the sea is where I can most easily connect with the indescribable magic of that realm. I always try to capture the magic in images and video, and this time I think I came pretty close, although nothing is like being there in person drinking in in with every fiber of my being. 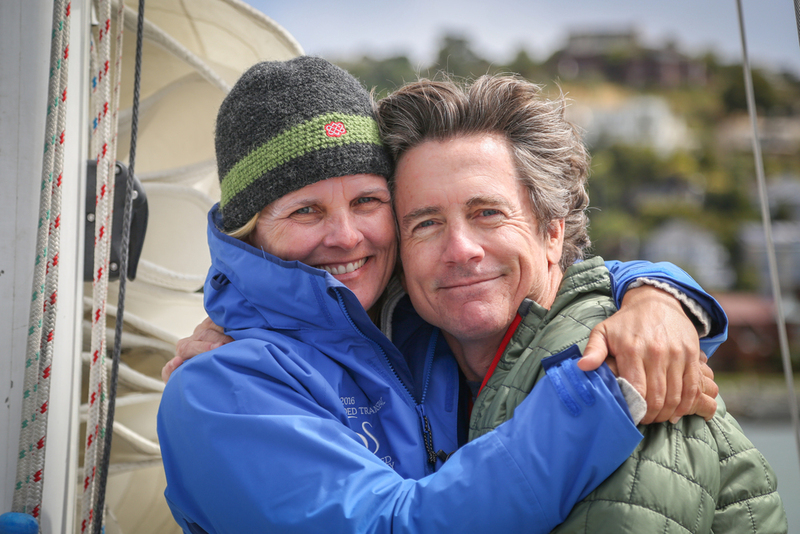 I just returned last night from one of the most fun and inspiring sailing experiences I have ever had. I want to write about it while it is fresh in my head (even though I still haven’t begun to chronicle the amazing experience of my 400 mile qualifier the week before). Haunani and I were lucky enough to have the company of Whitall Stokes on our last adventure. Whitall offered to join me to doublehand the PSSA Catalina to Port race when he heard me mention one day that I had zero experience flying a spinnaker (least of all by myself). 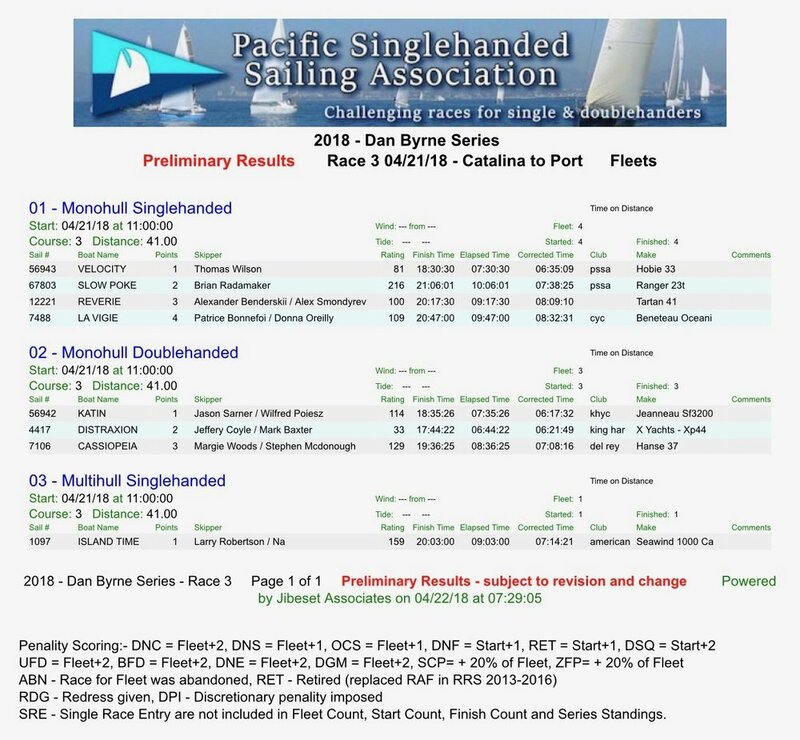 Since much of this race is downwind, it was the perfect opportunity to learn from someone who is a seasoned singlehanded offshore sailor, not to mention to spend the weekend with a great person. Whitall and I started to get to know each other a couple of months ago when I interviewed him for this blog. You can read the post here. Since then we have become fast friends and he has definitely become a trusted mentor. I really admire Whitall, not only because he is a very accomplished sailor, but because he is a very kind and genuine person. 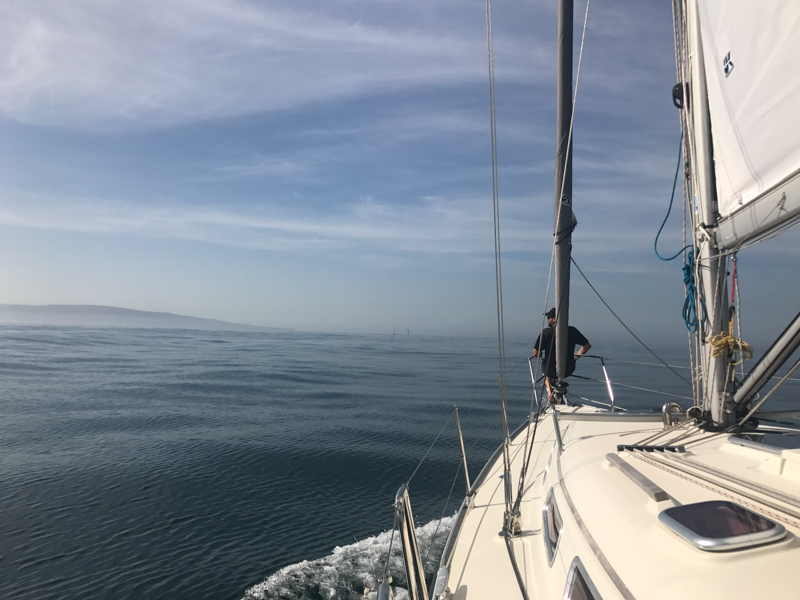 We set out early Saturday morning for the long and rolly journey of motoring out to the PV 10 buoy off of Palos Verdes. Since Whitall is the PRO of our club, our boat was the rabbit boat, so we were there waiting for the other three vessels when they arrived. As everyone gathered, the wind started to come up, and we were all poised for a great start to what turned out to be a very fun race. 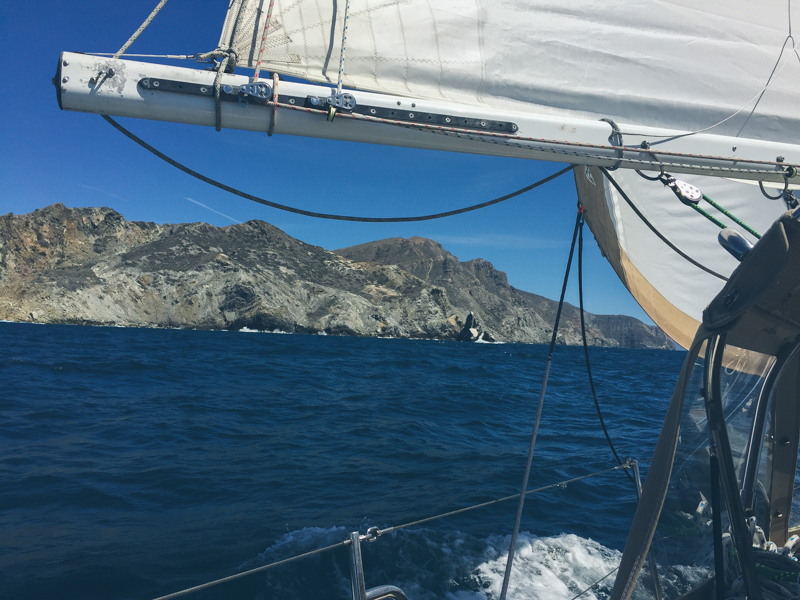 The wind filled in nicely, and we had a lively sail across the channel towards the west end of Catalina Island. We had a bit of a rough start due to a huge piece of kelp that got caught on our prop (the famous, crappy, soon to be replaced fixed prop that earns me endless amounts of sh*t from my compadres). It took both of us taking turns crawling down the swim ladder hanging of the stern wielding a totally MacGyver-knife-on-the-end-of-a-boat-hook-situation trying to cut the stuff off to even make a dent. It was a pretty pathetic sight that ended with both of us being more wet than dry...not to mention a stubborn piece of kelp remaining. My favorite thing about what I learned this weekend was the way in which it was delivered. First of all, Whitall is calm and collected at all times, and despite his sheer badassness, ego never enters into any equation with him on the boat. His lessons are conveyed mostly in the form of questions and invitations to self reflect. 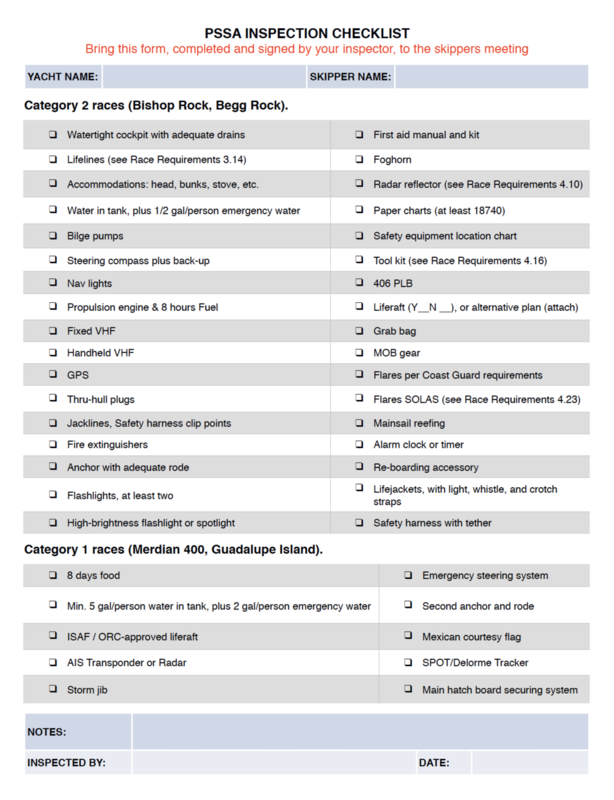 There were no harsh edges to any of it (except maybe endless well deserved sh*t about how much stuff is on my boat :-) ) but that is not to say he didn’t hold me accountable or that there was not strength and confidence behind every word. I always say that there is a reason I sail alone….mainly because, as social as I am, spending that kind of time in a small space and in intense situations with most people is challenging…unless they are the right people and it just works. I had a hunch we would get along and that I would enjoy having him on my boat, and I was right. What a true gentleman and wonderful guest! I am so grateful for our friendship and for the fact that I got to soak in as much as I did this weekend. I feel like my mind is bursting with all that I learned.. Since Friday, I have been fixated on the journey that 6 of my fellow PSSA sailors are currently undertaking. I have been tracking their progress on our PSSA tracker page with so much excitement. 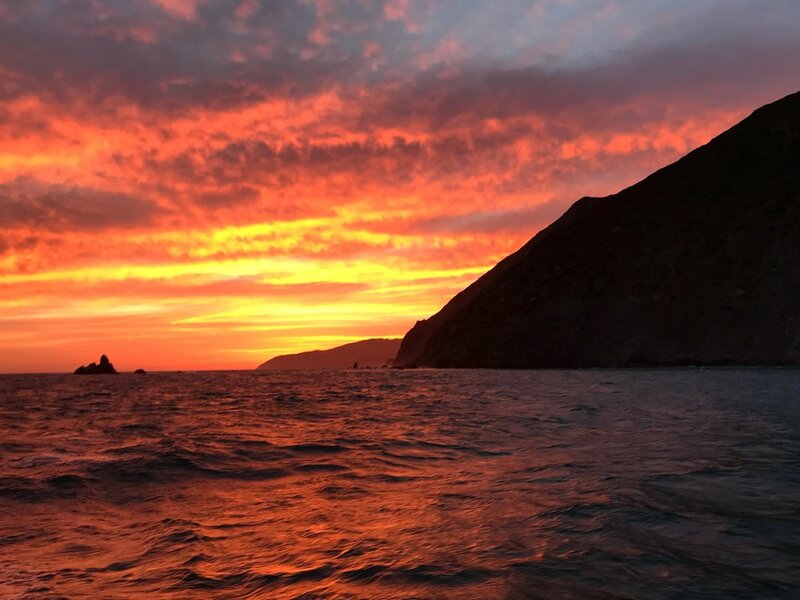 Seven men on five boats set out on Friday on the well known PSSA race around Guadalupe Island (in the waters off of Mexico). 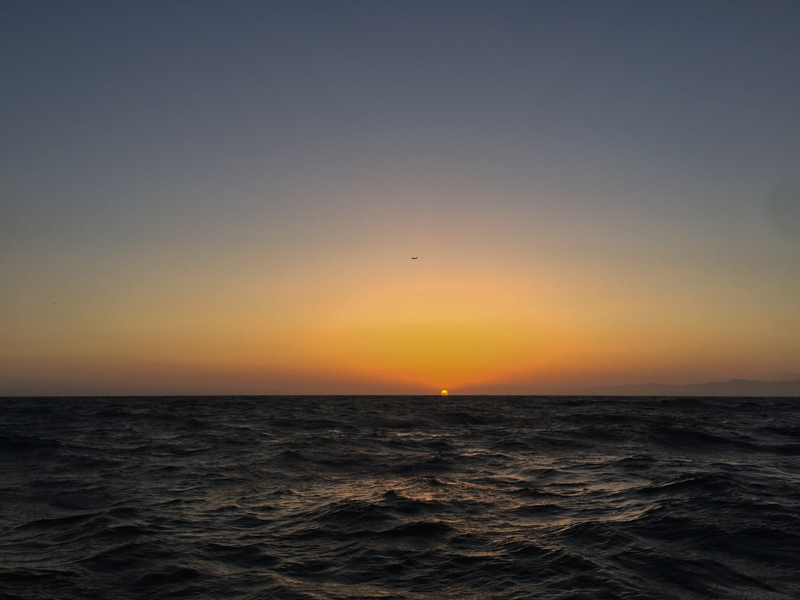 It is a 582nm trek all together, with the last half being a gnarly beat up to the east end of Catalina Island. 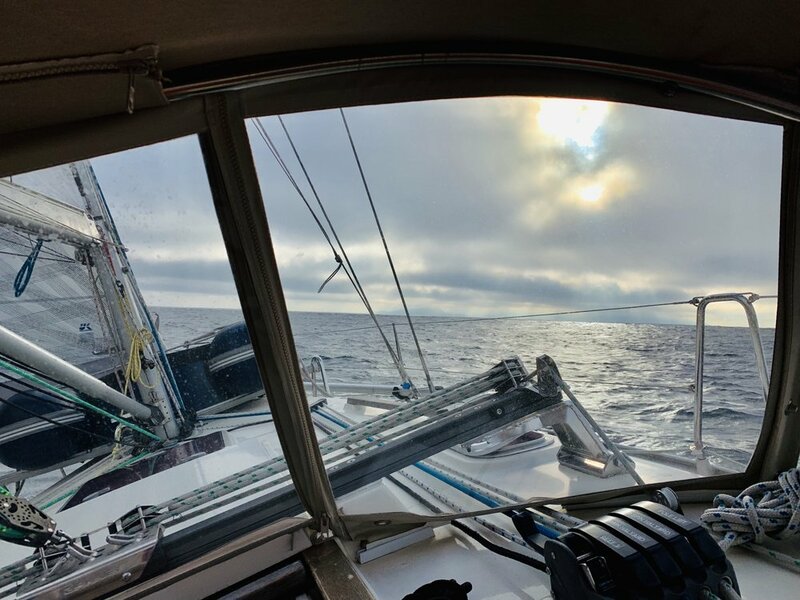 My heart goes out to one boat that had to turn around early on due to autopilot issues, and my enthusiasm and energy is with all of the rest of the sailors who are heading north towards the finish as I write this. It was great to be able to see them all start the race on Friday. Even though I did not race this year, it felt good to be there on my boat supporting them as they embarked on such an epic adventure. 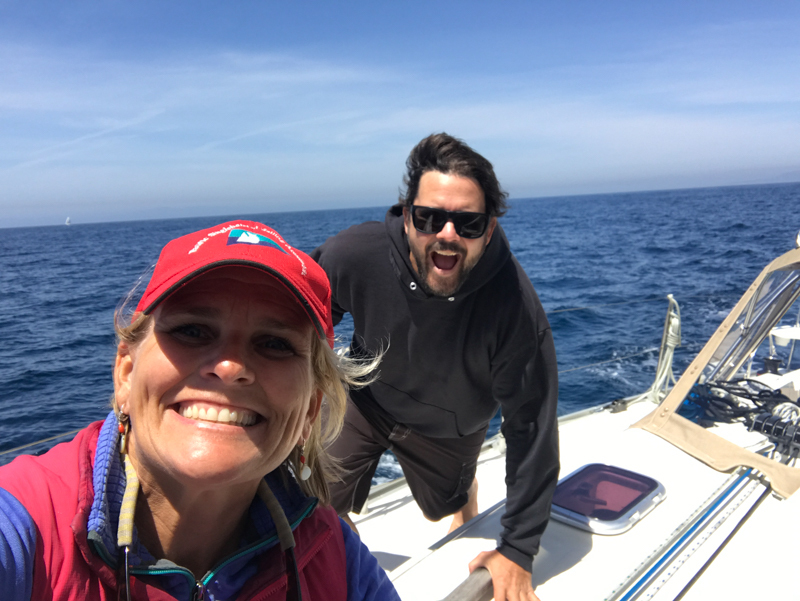 I even got sail next to one friend for awhile at the beginning of his race as I made my way to Catalina Island. They have rarely left my mind since I watched them disappear over the horizon that afternoon. I am so in awe of them all and cannot wait to hear the stories of their adventures. I find myself being infused with inspiration and motivation as I watch them make their way along the course. I have no idea how I got so lucky to be surrounded by such brave and experienced sailors but I have, and I am so grateful to know them all. Here's to you all!!! I am with you in spirit and cheering you each on like nobody's business!! !